Habit: Annual [perennial herb], prostrate to erect, generally hairy. Leaf: basal or cauline, alternate, linear to narrow, awns 0; ocreae 0. Inflorescence: terminal, generally cyme- or head-like, hairy [(glabrous)]; peduncles 0; involucres generally 1--6, tubular, 3--6-ribbed, teeth 3, 5, or 6, awned. Flower: 1(2), glabrous or hairy; perianth white, yellow, red, maroon, or purple, lobes (5)6, entire, notched or lobed to fringed; stamens generally 3, 6, or 9. Fruit: generally brown or black, generally elliptic, glabrous; embryo straight or curved. Species In Genus: +- 50 species: temperate western North America; southwestern South America. Etymology: (Greek: divided flower, for perianth lobes) Note: Involucre length measurements including teeth and awns unless otherwise specified. Chorizanthe minutiflora newly described, added. Habit: Plant generally erect, hairy, glandular. Leaf: blades tomentose abaxially. Inflorescence: bracts generally 2, awns 1--2 mm, straight; involucres 4--6(7) mm, 3-angled, 6-ribbed, finely transversely ridged, teeth 6, 0.3--3 mm, margins scarious, awns straight, longer three 1--2.5(3) mm, shorter three (0.3)0.5--1.5 mm. Flower: 1, 6--9(10) mm, glabrous; perianth 2-colored, tube yellow to yellow-white, lobes white to rose or red, oblong, fringed; stamens 9. Fruit: 3--4 mm. Chorizanthe fimbriata var. laciniata (Torr.) Jeps. Habit: Plant 1--2(2.5) dm. Leaf: blades 1--2(3) cm, 0.2--1(1.5) cm wide. Flower: 8--9(10) mm; perianth lobes finely fringed, distal segments barely wider than lateral. Chromosomes: n=20. Citation for this treatment: James L. Reveal & Thomas J. Rosatti 2014, Chorizanthe fimbriata var. 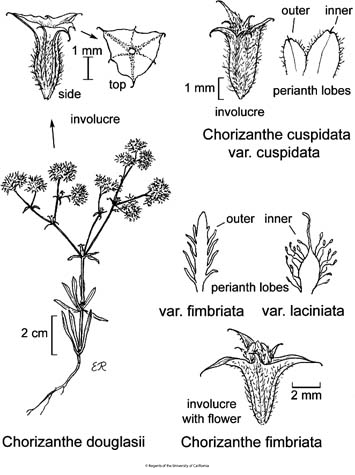 laciniata, in Jepson Flora Project (eds.) Jepson eFlora, Revision 2, http://ucjeps.berkeley.edu/eflora/eflora_display.php?tid=56490, accessed on April 19, 2019.
w PR; Markers link to CCH specimen records. Yellow markers indicate records that may provide evidence for eFlora range revision or may have georeferencing or identification issues. Purple markers indicate specimens collected from a garden, greenhouse, or other non-wild location.